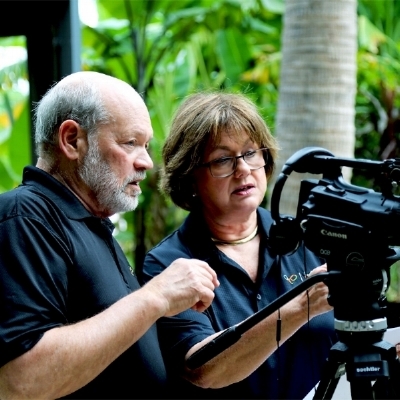 Cecily & Larry Lancit are EMMY AWARD winning veteran broadcast producers with over 40 years of experience in the industry. They founded and ran Lancit Media Entertainment in New York City for over 20 years. Lancit Media was best known for creating and producing READING RAINBOW, winner of 16 National Daytime EMMY Awards over an 18 year period, including 7 Emmys for Best Children’s Series. Lancit Media was also responsible for creating and producing other notable network series, including The PUZZLE PLACE (PBS), OUTWARD BOUND (DISCOVERY), RAMONA (based on the best -selling books by Beverly Cleary,) THE SADDLE CLUB and THE ZACK FILES (Fox Family). Lancit productions have been recognized by over 200 broadcast awards including numerous EMMIES, A Peabody Award, Hugo, Prix Jeunesse International, numerous Monitor Awards and many Cine Golden Eagles. Lancit Media received over $65 million in production funding from both the public and private sector. Their partners included Fisher Price, Sony, Toys R Us, Kellogg’s, Barnes and Noble, B. Dalton, and IBM. The Lancits also received significant funding from numerous prestigious foundations, including the Arthur Vining Davis Foundation, National Endowment for the Arts, National Endowment for the Humanities, the National Science Foundation, Ford Foundation, Carnegie Corporation and Pew Charitable Trust.